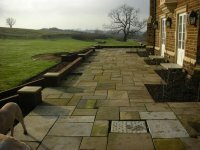 Reclaimed Flagstones Ltd has 30 years of experience to deal in reclaimed York flagstones, kerb setts and cobbles. We buy and sell mainly York Stone Flags, this is our speciality – there’s a big demand for York Stone flags and as the North West’s number one dealer, we have always got a good stock of quality paving. If you’re renovating old properties,if you are seeking good quality, hand graded York Stone Flags, then come to the UK specialists for the best deals. Based in Lancashire, we’re surrounded by lovely old towns abounding in properties built in the traditional gritstone that gives them so much character. The farmhouses, barns and cottages throughout the countryside have a way of blending into the landscape as though they’ve been there as long as the hills, because they’re built of the same gritstone rock they stand on. If you’re renovating or refurbishing one of these delightful old properties, then you’ll want traditional building materials for the walls and floors, stone that’s already been worn and weathered, with its own patina of age, to retain the character and appeal of your home. There is no finer paving than natural stone; it has been used for hundreds of years it is a natural product with natural texture and colour, incredibly strong, hard-wearing and beautiful. The most commonly used in the UK is the ‘York’ stone, quarried from the Pennine grit stones of Northern England, and used all over the country . 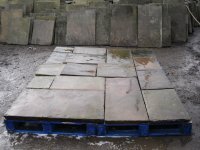 Reclaimed stone flags, have more character than newly cut flagstones, and are considerably cheaper. Reclaimed flagstones add instant charm to period properties, and look great in a garden setting, but can look out of place when used for a driveway on newer, modern properties. Although stone paving is considerably more expensive than the concrete alternatives, or the increasingly popular block paving, it has an indefinite life-span and a high re-sale value should it ever need to be replaced. The term “crazy paving” refers to the appearance of the finished surface, and too often, is undertaken as an simple alternative to more traditional paving, or because the stone itself is cheaper than rectangular units, yet, from a contractor’s point of view, it costs more in terms of labour to lay a given area than it does for ‘normal’ paving, there is a lot of intensive work involved in getting crazy paving to look good. However, when done carefully, it can be visually stunning. Our paving stones and slabs are ideally suited for outdoor areas, but they can also add a beautiful rustic feel to most rooms, including conservatories, sun rooms, kitchens and restaurants. Call Reclaimed Flagstones Ltd today on 01942 678070 for all your architectural stone requirements. We’ll be delighted to discuss our stocks of kerb setts, cobbles and stone flags with you and, if necessary, we’ll do our best to source whatever you’re seeking. 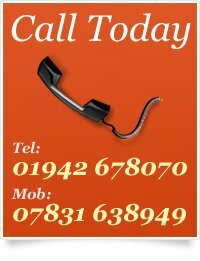 You can make your enquiry by email, if you prefer, or text us on 07831 638949 and we’ll get right back to you. Nationwide Delivery service with an on-board fork lift. We’re passionate about England’s architectural heritage, and here to help you source the traditional wall coping stones and authentic York flagstones for your property maintenance and renovations.